Comic Speculator News! Great blast from the past!! The name had come up recently and I started poking around the interwebs to see if anyone had referenced it and stumbled upon this and your other post on the topic. I think you're spot on in most of your timeline and I can add that there were definitely at least a few issues (not sure how many) that were free. Also, at some point the name, in a couldn't-have-summarized-the-times-better, was changed from "Comic Speculator News" to just "Comic News". Haven't been able to find any reference anywhere to any of those post-name change issues but I'm going to dig around in some old boxes and see if I can track any down. There was also some nice original artwork in these - I think this Superman might have been original. And when I poked around online I saw issue #1 (which I was able to find on an auction site going for $54!?) had a Simon Beasley original cover. Also, though I may be biased, I would dispute their posture as it related to the broader market. I think it was your other post about this mag where you had a few pages from another issue where reference was made in a negative light to the plethora of gimmick covers, numerous first appearances, new titles, etc. 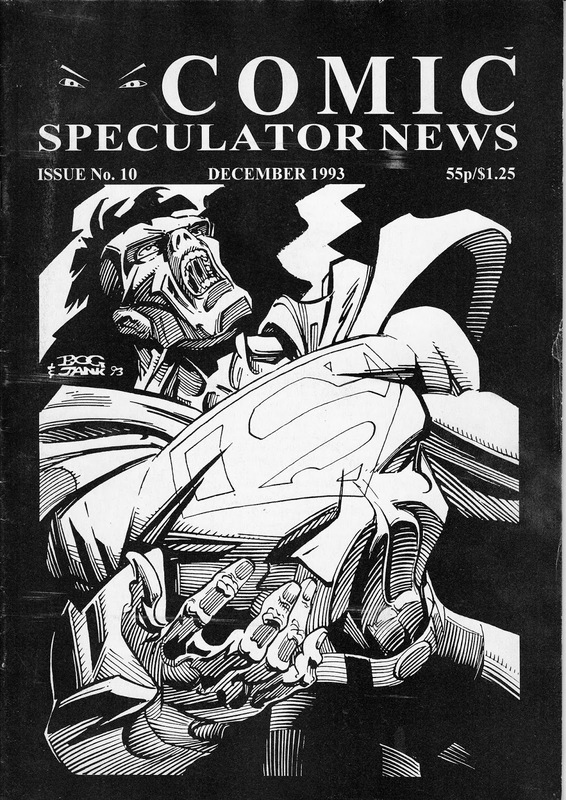 My take on Comic Speculator News was (at least toward the end) that they recognized that the market had reached a point of irrationality and they were trying to pick the gems hidden among all the trash. Maybe stockbrokers in a down market is the right analogy? To that end, and maybe a good way to settle the argument, I remember very very distinctly an issue where they had a featured list of the comics most likely to increase in value along with projections of how much they'd go up. I would LOVE to get a look at that and see how those fared - you may be right but my guess is that there were a good chunk that actually aren't in the 50p bins now. The one I remember distinctly being at or near the top of the list was Omega Men #3 which at the time was selling for about 3 pounds a copy. 25 years later that price has doubled at least 3-4 times, so I'd count that as a win. But I desperately want to see the rest of the list so will search for it and we can grade them! !